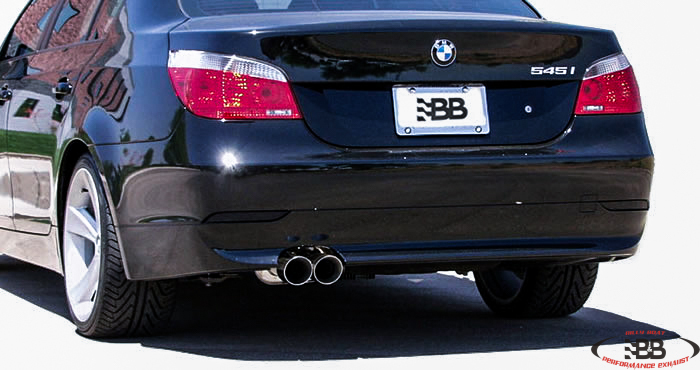 This stainless steel exhaust will give your BMW an incredibly deep rumble. The gains that this exhaust will provide you with will keep you ahead of the competition. The 3 1/2" tips will make your rear end stand out from all the other boring stock cars. Featuring mandrel bent, T-304 stainless steel and precision hand-craftsmanship, the system for the E60 provides custom-tuned performance with a harmonious, subdued exhaust note and no interior resonance. The proprietary design of each Billy Boat Performance Exhaust provides increases in horsepower and torque throughout the entire RPM band. All B&B exhaust systems feature Purge Resonance Technology (PRT), which means no glass packing which means a longer lasting muffler. The unique baffles within the muffler help keep drone down to a minimum. Aesthetics were another important factor in the development and design of this muffler system. Simply providing performance gains and a balanced exhaust note were not enough to declare this the ultimate system for the expertly engineered BMW E60. With a fully-polished muffler and twin 3.5" fully-polished double-wall tips the Billy Boat system delivers well beyond expectations.